Make a bold statement in the gym with printed starred leggings. Seen in the Resort 2018 collections of many top tier fashion labels, monograms are making a comeback from their late 90's and early 2000's golden days. This season, Gucci applied its iconic ‘GG’ logo on fur-trimmed coats, trousers, skirts, and accessories, while Louis Vuitton used iterations of its classic ‘LV’ motif on bags and accessories. Here, three monogrammed and labeled pieces that take the look from the runway to the gym floor. This top features a functional compression fit, while the iconic gold Medusa logo and Greek print add chic flair. Pair it with black leggings for a sleek look that focuses the attention on your upper body. These bold, sweat-wicking leggings highlight the brand’s star logo. Add a matching sports bra to complete the ensemble. 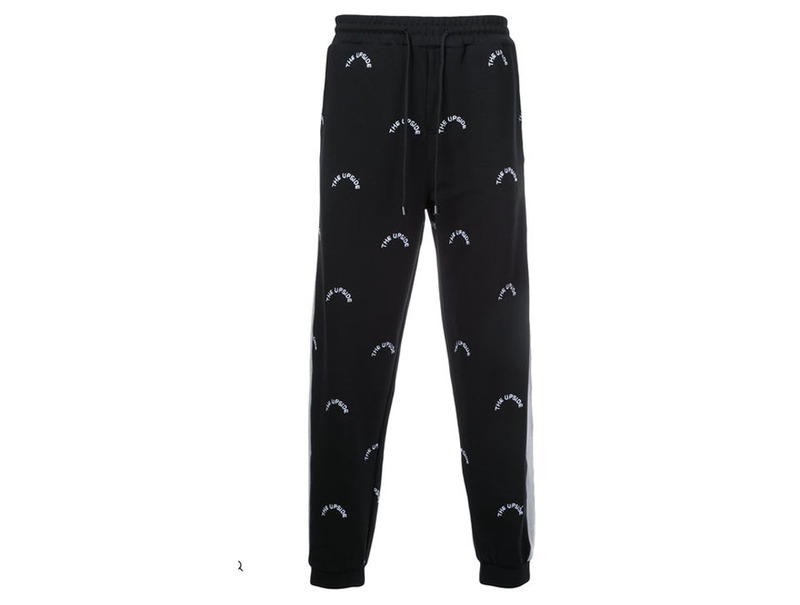 These men's bottoms are perfect for yoga classes and recovery days alike. Add a sweatshirt and black sneakers to create an edgy look.